I’m participating in a blog tour! It’s like a chain letter, but a million times better, ’cause you only have to write once, and there aren’t any threats about receiving bad luck if you don’t do it on time! I didn’t expect, when I moved back to Portland a year ago and started the path toward becoming a children’s book illustrator, that I would meet so many kind and generous artists. I kinda thought that being an artist was a solitary thing, and that I would just somehow try to find my way on my own. In the fall I began taking illustration classes, and since then I keep meeting the most wonderful people in the children’s book field, and they’ve blown me away by their openness and willingness to share, connect and encourage. Being new to this field, I don’t know if that’s normal or not…but it feels like a gift! I was tagged for the blog tour by one of those wonderful illustrators, Victoria Jamieson. 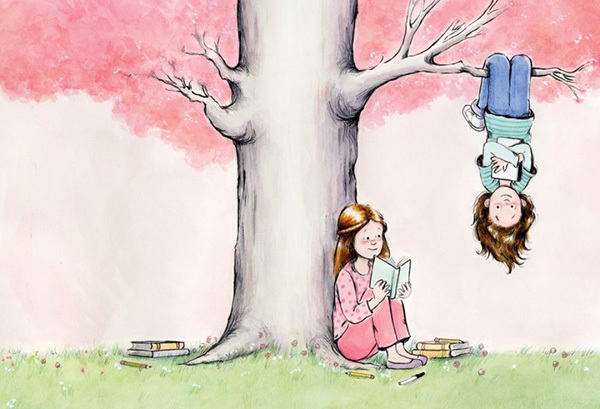 Love this book jacket she illustrated…makes me want to be BFF’s with those girls! I took two of her CE children’s book classes at PNCA this past year, and they were superb! She’s super talented (check out her books here!) and she’s given me tons of help and encouragement this past year which I’m so thankful for! You can read her blog tour post here. And now for the blog tour questions! One thing I love about children’s illustration is how much room there is for so many different styles and voices! Of course there are trends and such, but it seems that there’s a place for many different styles, from traditional to edgy, and that’s very freeing! As I’m on the starting-out end of things, it’s easy to stress about finding my place and my unique style. I’m doing my best to not worry too much about it…and to just keep making and making and making… so that thing that is “me” will naturally surface. So right now, I’m just trying to do my thing (and part of “doing my thing” is practicing and exploring and trying new approaches), and trust that since we’re all unique individuals, something special and different will come out. How does my individual writing/illustrating process work? For illustrating, I start off with lots of super loose sketches just to get something—anything!—down on paper where I can analyze it a bit better. I try to keep it super quick at this point so that I can easily change ideas and move in new directions. Once I have the basic idea figured out, I refine the sketch, solving problems and developing ideas. I keep revising the sketches until I get everything down just how I want it to be in the final artwork. This is the hardest part of the process! There’s definitely a LOT of erasing and re-drawing going on! For the final art, I trace my revised sketch onto watercolor paper (I like Arches 300lb hot press) using a light box. I don’t have a window-less room in my apartment, so sometimes I have to wait until night to be able to see the sketch through that thick paper! I like using the 300lb because the thinner paper ripples which drives me crazy when it comes to scanning (and I don’t like to mess with stretching my paper)! I use a combination of watercolor, gouache, colored pencils, ink, and graphite. I usually do some tweaks and adjustments in Photoshop, but for me there’s something hugely satisfying about using traditional, hand-held materials. Plus my neck and shoulders get all cramped up when I draw for more than like 20 minutes on the computer! Who are the two author/illustrators that you are passing the interview on to?